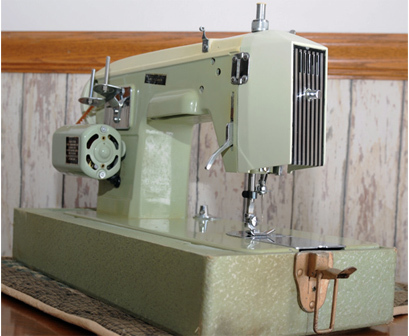 There are a lot of brand-name machines that have been made over the years and every store of any size had their own label. However, when Elizabeth saw this machine at our local Goodwill store with the name Electro Hygiene, she grabbed it. Cost was $10.00 when she bought it in May 2009. 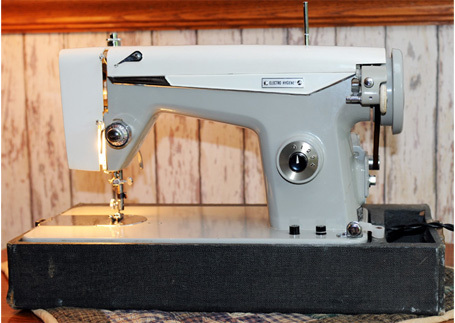 The large round knob on the right dials in stitch length and pressing a black button in the center causes reverse sewing. Two buttons on the base raise and lower the feed dogs. We tried some free-motion sewing with the feed dogs lowered and were able to make a number of nice tight circles..
We did a Google search of the words "electro hygiene" and most hits obtained were for electric toothbrushes. However, we did find McCormick's Electro-Hygiene Company in Youngstown, Ohio. The Web Site indicates they have been there since 1964. Bill Holman tells us that the Electro Hygiene brand name was originally owned and used as a 2nd label by Royal Vacuum Cleaners, and they eventually authorized Julius Toth of Dayton, Ohio to distribute them under this name. 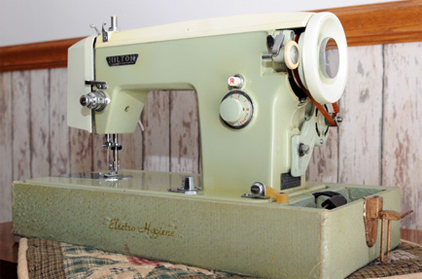 During this time, Toth also used the Electro Hygiene name on quite a few generic Japanese sewing machines which he both wholesaled and retailed. The Electro Hygiene machine does two things--it sews forward and backward. The image to the right shows our results sewing with it. 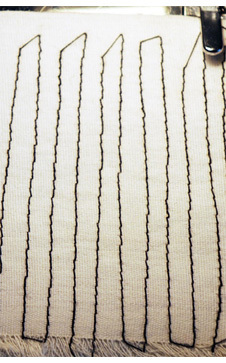 We have seen nicer stitches. 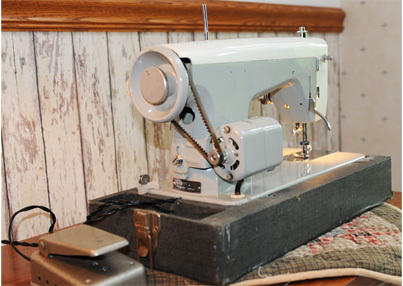 However, we hate to blame it all on the machine as the uneven stitches could well be due to operator error, thread tension out of adjustment, etc. We intentionally tried to let the machine pull the fabric through at its own pace while trying to maintain a constant speed. 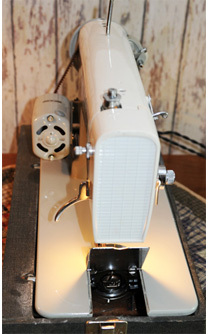 The Electro Hygiene has a vertically mounted bobbin which looks a lot like many older Singer sewing machines. The bobbin is installed through the hinged plate shown here. Our plate wanted to stay somewhat elevated at first, but we adjusted a spring on the bottom and it now fits perfectly. The face plate is not particularly attractive but does the job since this is obviously a no-frills machine. This is the second Electro-Hygiene machine we acquired. It is a bit fancier than the machine shown at the top of this page. However, the machine's capabilities do not appear to be improved. The faceplate is certainly more embellished than the earlier model.